in Sfakia, on the southwest coast. 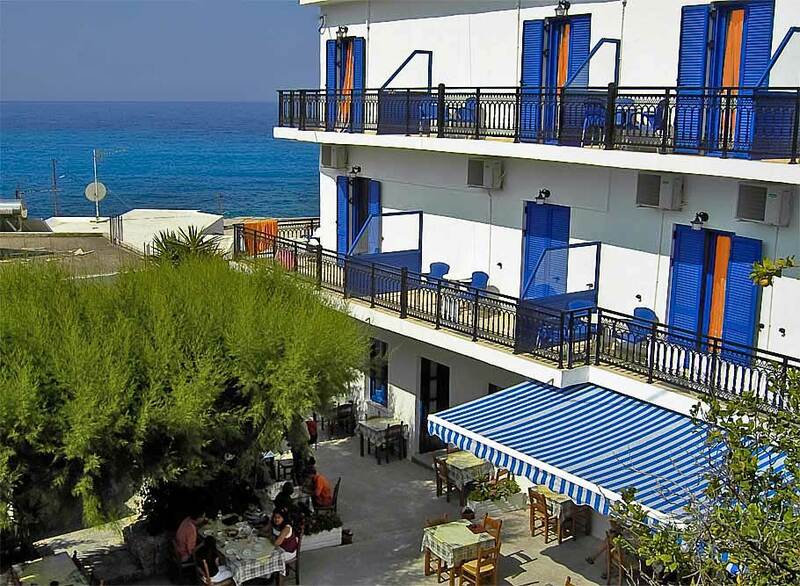 Hotel Stavris is a family run hotel accommodation in the village of Chora Sfakion, southwest coast of Crete. We offer our guests clean rooms, and studios and apartments with kitchenette. Many have direct sea view. Our hotel is just 50 metres from the beach. In our outdoor café we offer breakfast and drinks, and good company, in the shade of a beautiful tree. Our renovated hotel is famous for its hospitality since 1969. We can offer you single, double and triple rooms with refrigerator, studios with kitchenette and refrigerator, and two-bedrooms apartments with kitchenette and refrigerator. All accommodations have air conditioning, a private balcony with sea view and/ or mountain view, and a private bathroom with shower, washbasin, hairdryer and toilet, and free Wi-fi. They get cleaned every day, and supplied with fresh linen and towels. From our village of Chora Sfakion you can start your day trips, to visit the surrounding villages, by ferry boat or hire car. You can also start many hikes on the ancient footpaths that cross the mountains. There are a diving club, fishing trips, and yoga classes. You find good food and drinks in the local restaurants. There are no bars or night clubs. We are your hosts Aris, Giorgis and Stavros Perrakis. Our father Stavros started in 1969 to rent 3 small rooms above his shoe repair shop and mini market in Chora Sfakion. Later we joined and expanded his business. Stavris means "big Stavros", and this name we gave to our hotel. Look at the photos of our rooms, studios and apartments. You also find photos of the direct environment, and of the good atmosphere on our "square", under the shady tamarisk tree of our outdoor café, where we serve breakfast and drinks. In our outdoor café you can meet the local people for a drink, and also our guests from all over the world. Many of our guests visit us every year, once, twice or more, and several of them already since 1969! Some of them visit us just to relax, others are passionate hikers. We enjoy each others company. How to reach us in Chora Sfakion, southwest coast of Crete, by car, by public bus, by ferry, by taxi, or on foot. To see our room and service rates, click below for our price list. You can also make a on-line reservation there. Copyright © Hotel-stavris-sfakia-crete.com 2001 - 2019. All rights reserved.